A brand new and highly specified luxury three/four bedroom town house with a garden and a car parking space close to the old town walls of the ever popular ancient medieval market town of Ludlow. Grove House is one of four luxury town properties which have been carefully designed to offer a modern contemporary flavour combined with easy to manage bright and spacious accommodation. Two of these excellent properties have already been sold and are occupied. This just leaves buyers with the opportunity to buy the other two and Grove House would ideally suit the discerning retired couple moving into Ludlow from busier parts or from the countryside to be closer to shops and amenities. Only a few minutes' walk from the town centre, Grove House has a superb open plan sitting room/dining area/kitchen. A focal point in the sitting room is a wood burning stove. From the dining area glazed doors lead out onto the south westerly facing rear garden which attracts most of the day time sunshine and is a wonderful space for alfresco dining. The kitchen is fully equipped with Shaker style units and integrated appliances include a dishwasher, fridge, freezer, built in oven and hob with extractor. There is also an automatic washing machine and drier. 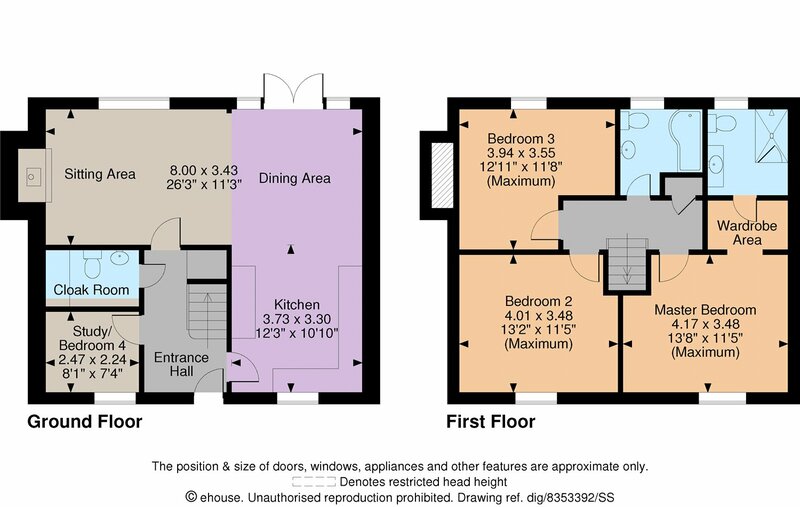 As well as three good sized first floor double bedrooms there is a ground floor study which could be an optional fourth bedroom. The master bedroom is a special feature leading into a dressing area and then into the en-suite shower room. The ground floor has engineered oak floors with underfloor heating and there is also underfloor heating in the bathroom and en-suite. The designated parking space in a huge advantage. Ludlow continues to attract buyers from far and wide. It is famous for its festivals in the ancient castle and also has a reputation for culinary excellence in its many restaurants. The beautiful surrounding rolling hills of South Shropshire are some of the best in England. On foot from Nock Deighton�s Bull Ring office, proceed down Old Street and Pellow Court is on the left hand side identified by our for sale board.